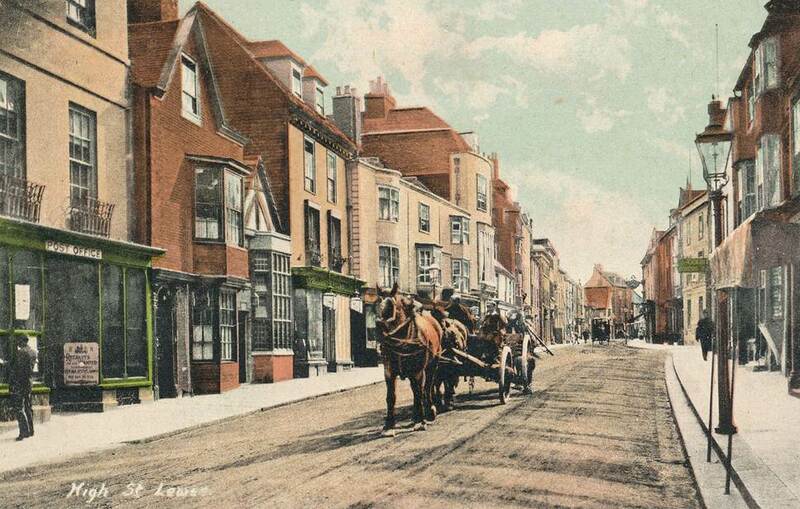 An Edwardian view of the High Street from a postcard published by A.H. Homewood of Burgess Hill. The notice in the Post Office window seeks recruits for the army. The monastic institutions of Lewes included the hospitals of St James and St Nicholas. “The hospital of St James, near the gate of the Priory, was for thirteen poor brethren and sisters, whose duty was to pray for the founders and their heirs. The chapel, now much patched, is still standing. 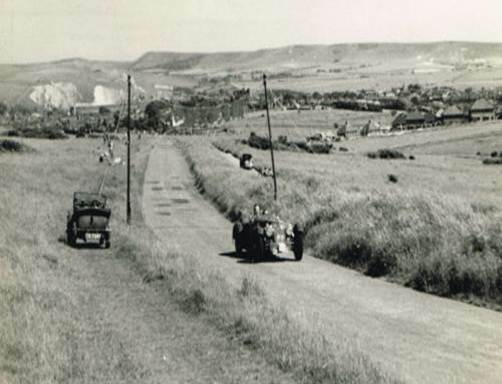 This 1939 photograph is said to show George Weldon’s Alvis sports car participating in the Lewes Hill Climb. The photograph shows Firle Beacon and the South Malling chalk pits in the distance, and what is I think the Neville estate advancing across the Downs to the right. At 11 a.m. on Sunday 3rd September 1939, people throughout the land sat listening to their wireless sets as Mr Chamberlain, the Prime Minister, proceeded to make a declaration of war against Germany. The next day a train loaded with schoolchildren pulled into Lewes railway station. A contingent of children from the Parish Church School, Croydon, had been ‘evacuated’, transported from a place in war-time suburban London that was thought likely to come under enemy air bombardment to a place in the countryside that was expected to be safe from attack. At just over nine years old I, along with my two brothers, Maurice (ten) and Ronald (seven), was among the evacuees. For us it was to be the start of a series of adventures that would become indelibly etched in our memories. Carrying attaché cases, gas masks and carrier bags containing emergency food rations, which included a tin of bully beef and two packets of biscuits, we left the train and marched to All Saints Hall at the bottom of Station Street. There we were given something to eat and drink and arrangements were made to find foster homes in and around the town. In a tearful farewell in Croydon, Mum had told us not to be separated from one another so our insistence on staying together made it difficult to find a home and we were the last to leave the hall. Mr Cranham, a teacher from our school together with a billeting officer took us to what was thought to be a suitable part of the town and the process of knocking-on-doors began. At first nobody seemed willing or able to take on three young boys. Eventually, however, we were installed in a fine detached house, at the comer of Houndean Rise and Southdown Avenue, owned by Mr Perrit, a retired schoolmaster, and his wife. Mr and Mrs Perrit were a well-to-do childless couple used to gracious living. That included the services of a maid who lived-in, a cook who came in each morning to make preparations for the dinner chosen by Mrs Perrit, and a part-time gardener. Tradesmen were expected to use a side entrance to the house. We were looked after by the maid. After she sounded the gong in the hall we would usually go and eat with her. There was one occasion, though, when we had lunch with Mr and Mrs Perrit. It included peaches, fresh from the garden, and our hosts used napkins that were secured in silver rings when not in use. My brothers and I had been used to “dinner” at lunch-time and, more often than not, tinned peaches. We had been used to decorated paper serviettes at Christmas, but for the rest of the year we devised more creative ways of cleaning our sticky fingers after eating. After evening meals the maid was responsible for bathing us and putting us to bed. A bath every night in a white enamelled bath was certainly a change from the less frequent wash in the tin bath in the two-up, two-down, cottage-style house that we had previously known as home. In objecting, one night, to a bath I was told quite firmly that if I did not behave myself I would end up in the Prison, which could be glimpsed from the garden. Mr Perrit loved jig saw puzzles, particularly those he designed and made himself, a quiet afternoon rest, good conversation and obedient children. In addition to seeing that Mr Perrit’s every wish was met, Mrs Perrit, who was considerably younger than her husband, instructed the gardener and maid in their various duties, supervised the production of jam from crab-apples grown in the garden and involved herself generally in good works. When the need arose she would drive her little black car to town to do some shopping, which might include the purchase of coffee beans or some meat from Marsh’s the butchers at the top of Station Street on the opposite side of the road from ‘Ye Olde Tobacco Shoppe’. My brothers and I loved activity and noise, in both of which we indulged to the full when we steeple-chased along the garden paths. Looking back, the differences between the social and cultural backgrounds of Mr and Mrs Perrit and their little evacuees were almost certain to lead to problems. One day, as the result of some minor irritation on my part, Mr Perrit saw fit to rebuke me. My cheek in answering him back angered him even more and he gave vent to his fury by striking me across the face with the back of his hand. Whether or not it was this incident that led directly to our departure I cannot say, but only a few weeks after being billeted in our first foster-home we were preparing to go to our second. It was to be a home that Mrs Perrit thought ‘more suitable’ for us. She knew the lady concerned and thought her ‘nice’. Mrs Perrit celebrated the relief of her husband and herself at our departure by buying each of us a small present, in my case a box of lead Red Indian braves on horseback. Then we were bundled into her car and driven off to Miss Hunter’s. This Victorian photograph was taken from the bottom of School Hill, looking towards the present pedestrian precinct. 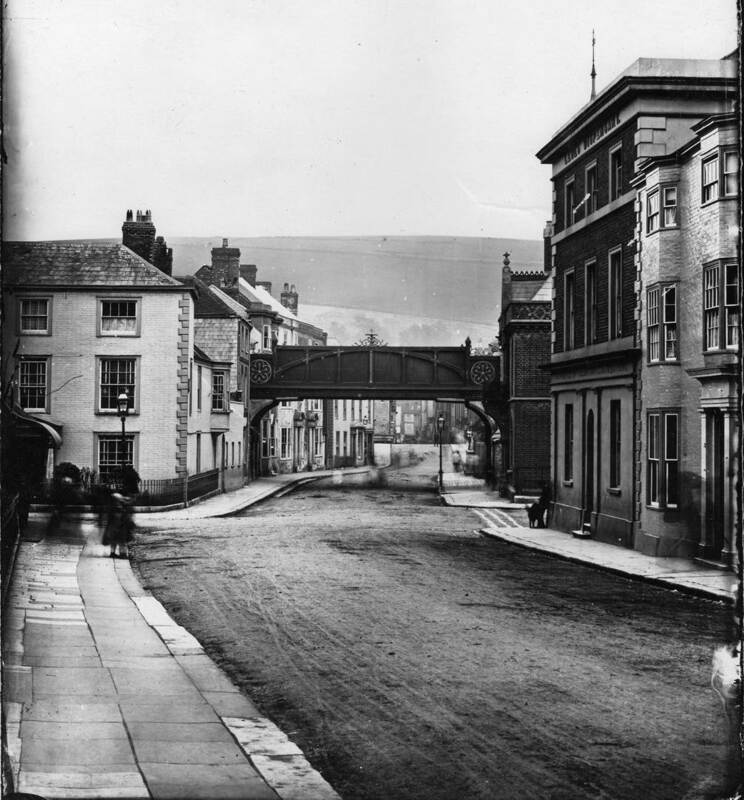 The Lewes Dispensary and Fitzroy Library are on the right, either side of the entrance to Friars Walk. There is a private residence at the entrance to Eastgate Street, where Boots now stands. The bridge carrying the Lewes-Uckfield railway line dominates the High Street beyond Friars Walk and Eastgate Street, and Cliffe Bridge can be seen beyond the railway bridge. This entry was posted in Biographical Literature, Lewes, Local History. Bookmark the permalink.